Happy Friday! It’s the weekend and I am so ready for it. It has been one exhausting week, so I think it’s time for a little Casual Friday. Casual Fridays can be something fun and simple or they can have just a wee little bit of booze. Today we have all of those things as we head back to The Brown Hotel in Louisville, Kentucky to learn how to make the proper Mint Julep! After all, we have to get some practice in making these cocktails with the Kentucky Derby just around the corner! I am now a huge fan of this Derby Day classic after learning how to make a good one. The others I have had over the years were medicinal and cloyingly sweet and frankly, gave this little cocktail a bad name. Once you learn how to make it the right way, you will be a fan, too! 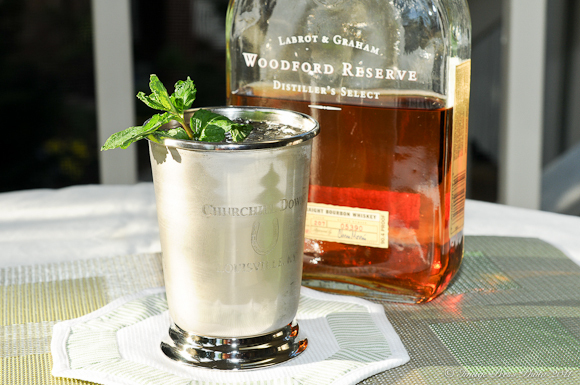 We do know that the Mint Julep originated in the southern United States, most likely during the eighteenth century. It is said that the U.S. Senator Henry Clay of Kentucky introduced the drink to Washington, D.C., at the Round Robin Bar in the famous Willard Hotel while he resided in the city during his term as senator. Rebecca makes a mean Mint Julep! 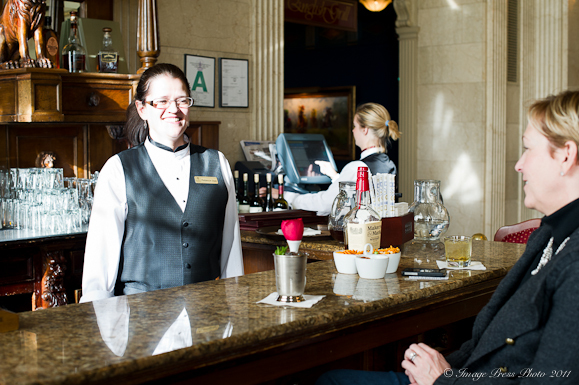 We asked Rebbeca Dyer, one of the bartenders at The Brown Hotel, to show us how to properly make the Mint Julep. Since she has been a bartender in the City of Louisville for twenty-three years, I bet she knows a think or two about making one of these drinks, don’t ya think? 2. Use a nifty little silver cup if at all possible. It keeps the spirits cold and your cocktail will be perfectly chilled the entire time you sip it, preferably watching the Derby. We purchased our little silver souvenir cup while we were in Louisville. 3. You need to used crushed ice. The cocktail won’t be the same without that. 4. Steep the mint in the simple syrup when you make the simple syrup. Spearmint is the preferred mint. (Wrap it in cheesecloth so you won’t have to strain the syrup once you remove it.) Be sure to let the mint sit in the simple syrup for awhile. You should make the simple syrup ahead and let it sit overnight. Forget about the muddling stuff. 5. Use a good bourbon. Since Woodford Reserve is the official bourbon of the Kentucky Derby, we decided to make ours with that particular bourbon. Bourbons have different tastes, so your Mint Julep may have a slightly different flavor depending on the bourbon you choose. 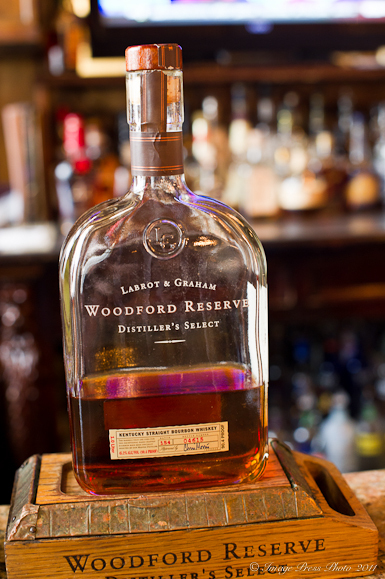 Woodford Reserve is one of the few rye bourbons. 6. Garnish with a sprig of fresh mint so that you get a heady aroma of mint as you bring the cup to your lips to sip! These drinks can be a bit sweet (unless you use a whole lot of bourbon! ), so The Brown Hotel adds a little bit of Club Soda to finish the drink at the end. It’s a nice touch and gives it a bit of fizziness, which I enjoyed. Make a few of these and a Hot Brown or two, kick back, relax and enjoy your weekend! * Audio sounds on video are courtesy of The Freesound Project. We liked a 50/50 ratio of bourbon to the mint simple syrup. You may prefer a different combination. I suggest that you keep tasting them until you get it right! * For simple syrup - Combine equal amounts of sugar and water and several sprigs of spearmint (tied in cheesecloth) in a small saucepan over medium heat until sugar melts. Cook it a few minutes to get a thicker syrup. Remove from the heat. Let this mixture steep for awhile. You can taste it and see if it is minty enough for your taste. Remove the mint from the syrup. Transfer to a container and refrigerate overnight. Place crushed ice in a silver cup, preferably. Pour in bourbon and mint simple syrup. Stir. Add club soda, if desired. Garnish with fresh mint. That’s one of my favorite brands of bourbon! I have to say that I’ve never actually had a mint julep. That will have to change! I was just in the garden this morning and observed a whole lotta mint coming out of the ground. Will give this one a go… with our Knob Creek, because that’s what we happen to have. We have Knob Creek, too! And mint! 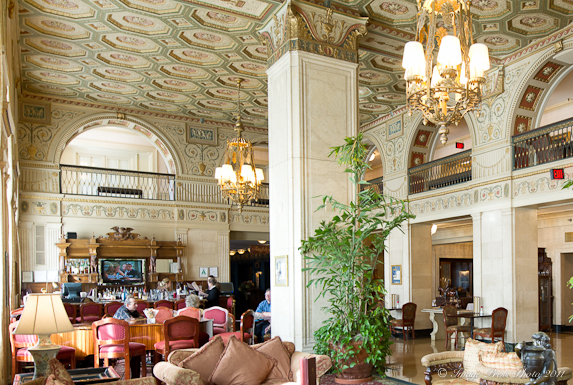 I LOVE the Derby – it’s the only horserace I bet on when it’s off-season in Del Mar 😉 Looks like a stunning and charming hotel, and am glad to see you’re making the rounds to the best bars to learn how to make the official drinks of the season! Woodford Reserve is a great middle of the road bourbon. Not too sweet…not overly overpowering with oak tannins. If you like sweet Makers Mark is a traditional choice…it was our favorite bourbon in college. Nowdays, Charlie likes Jefferson Reserve and I like Blantons. The new Angels Envy is pretty good too. So many bourbons, so little time! Great posts about the Derby. I have my hat, but I don’t have any bourbon or fresh mint. I’m running t the store as we speak! Joyce – My guess is your college experience was a little more posh than average. I believe we were “enjoying” Jack Daniels and Jim Beam in college. For the money, Buffalo Trace is worth checking out. Very smooth and surprisingly affordable. Here you are at another destination on my “bucket list”. We watch the Kentucky Derby every year and toast with a Mint Julep – although I need to purchase some silver cups to make it really authentic. I’ve wanted to visit the thoroughbred farms and do the Bourbon Trail, some day…. Only the Very Best Coconut Cupcakes for my Peeps!